A full, beautiful smile can say a lot about you. It can give you the confidence to speak in front of a large audience, smile in your family photos, or eat all of your favorite holiday meals. Whatever makes you miss your smile, the Sage Dental Care team can help you to replace it. With dental implant supported dentures, your entire smile is renewed from the roots up. If you want to learn more about the restoration options available in our Reno dental office, call our team to schedule a tooth replacement consultation appointment. We have offices in North and South Reno, so wherever you live or work, there’s a Sage Dental Care location near you! Following the loss of one or both rows of teeth, there are a few options available to restore your smile. A traditional, removable denture can be crafted using a gum-colored base fitted to sit snuggly against the gums. This snug fit creates suction that holds the denture in place. While removable dentures offer some improved dental function and appearance, they only allow for about 20% of natural chewing ability significantly limiting diet. The tendency to shift and slide also makes removable dentures a less-than-ideal solution when it comes to boosting confidence. A dental implant supported denture seamlessly recreates your smile. With just four to six dental implant posts, your denture will restore as much as 70% of your natural chewing ability, allowing you to eat all of your favorite foods. The increased stability also improves your confidence when speaking and smiling in any personal or professional context. Who Should Consider Implant Dentures? If you want to improve the stability of your current denture or you recently lost numerous teeth, we encourage you to consider an implant-retained denture. These custom crafted dental restorations are able to closely mimic your natural smile in appearance and function. 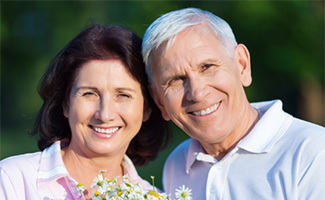 During your tooth replacement consultation, we’ll examine your current oral and overall health to determine whether or not you’re a good candidate for implant dentures, but innovations in the treatment methods and materials used make implant supported dentures a great tooth replacement option for almost everyone. Are Implant Supported Dentures Permanent? Once in place, an implant-retained denture can last two decades or longer. This is compared to traditional dentures that need to be refitted, repaired, and replaced regularly to ensure a proper fit. 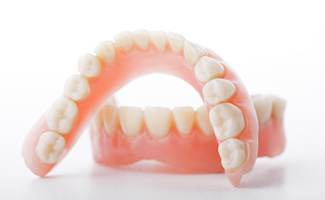 Many people end up keeping their implant denture for the rest of their lives. 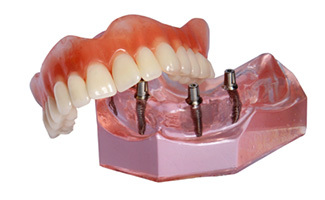 What is the Implant Dentures Process? The placement of a dental implant supported denture is a multi-phase treatment process. We begin by preparing your smile. This may include extracting teeth, placing tissue grafts, or providing oral health improving services like gum disease treatment. Then we strategically position your implant posts. Following placement, your implants will need several months to fuse fully with your supportive bone and gum tissue. In the meantime, we may provide a temporary denture prosthetic. Once your implants are fully fused with the gum line, we will attach your final denture, recreating your healthy, happy smile. Are there any Limitations to Implant-Retained Dentures? 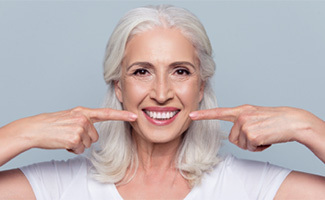 Luckily, dental implant-retained dentures negate many of the limitations associated with traditional dentures like lose fit, loss of gum and bone tissue, and limited diet. For some people, implant supported dentures are a little more difficult to clean than traditional dentures. Using an air or water flosser to remove plaque buildup between the denture and gums is a simple solution to improve oral health, simplify cleaning, and help you keep your implant denture in place and functional longer.